Today morning I completed reading Harry Potter and The Cursed Child. The last edition of the Harry Potter series, but in the form of a play script, being acted out in the London West End. If you know me at all, you will know I am gaga about the Harry Potter series, books as well as the films. Like many others, the words in these books meant so much more to me, and I can not thank J.K.Rowling enough for creating this superb magical world. Today I want to tell you about how my journey with Harry Potter began, all of which I remember vividly. 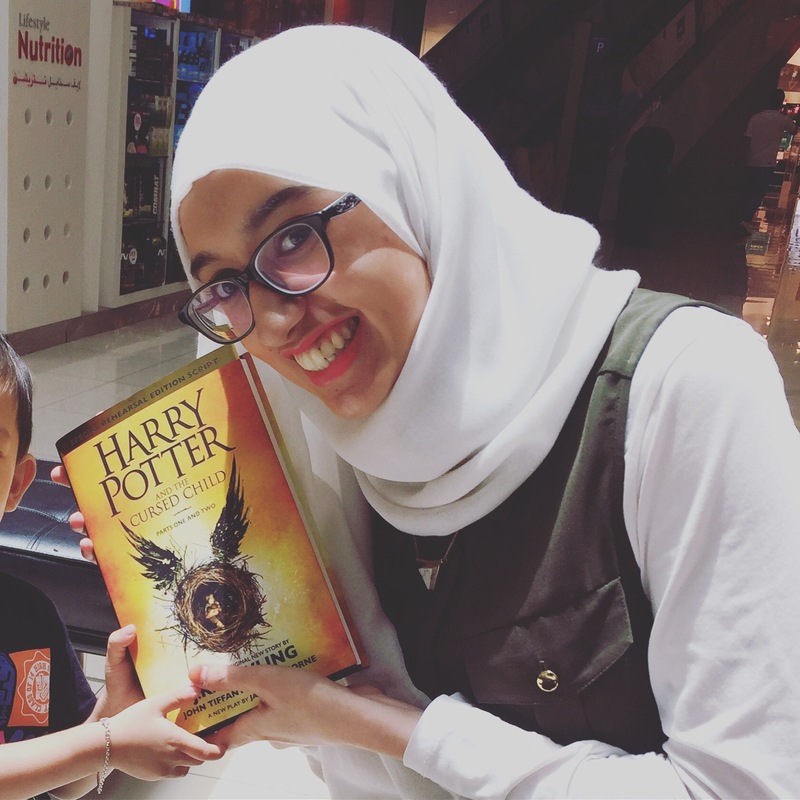 I had only just moved from Saudi Arabia to England, aged 10, when I was at a cousin’s house who happened to be watching Harry Potter and The Philosopher’s Stone on the television. (My cousin, who also happened to look very much like Harry Potter himself!) I was enthralled by the movie, and decided to start reading the books. A few of them were already in my school library by that point, so I made my way through the books, reading them non-stop, keeping them under my desk at Primary School, ready to bring out at any given opportunity. By the end of primary school, I was up to Harry Potter and the Goblet of Fire, and very much a Harry Potter nerd. I think the reason why J.K.Rowling’s world appealed to me so much was due to my relocation from one country into a completely different one, and perhaps I needed a coping mechanism to deal with all the new changes in my life, and books were just that. Though I made plenty of friends, was doing great at school and loved my new life, I still needed somewhere I could escape to, a world I could get lost within. I was a total book nerd and there was no better book series to begin my love of books with than this. Oh how I had wished that Hogwarts was indeed a real place and we really could cast spells, many of which I learnt and play acted too of course. As I grew, my admiration for J.K.Rowling’s words grew too. The time that the last book: Harry Potter and The Deathly Hallows was published, I was in USA for a residential summer camp with one of my best friends, aged 14. The hype created by Barnes and Nobles over there was insane, and we went to watch Harry Potter and the Order of the Phoenix with a group of friends on the first day, before the camp had begun. I checked the price, and thought hard about the money that my parents had given me to spend whilst away on this 3 week trip. Though I adored the Library lent books, I wanted a copy of my own. One I could cherish and read to my hearts content, time and time again, and the last book seemed to be the perfect one to buy. Coming back to the university that was hosting the camp, the most humongous of books held in my hand, my most prized possession at the time, I couldn’t be happier. I devoured every word of the 607 pages within 2 days, whilst participating in all the summer camp activities in between reading, imagining and dreaming. There were a number of other girls who had purchased the book too, and we all swore to each other not to spill any spoilers, and to only discuss it once we had all finished reading the book, which we did. In great detail. I really appreciated that even though the best friend I was with, was not really in to the Harry Potter books, she gave me plenty of space and time to revel in the excitement. Another “friend” was not as respectful, and was swiftly locked out of my bedroom and left knocking the door until I completed the book in peace, in the early hours of the day. Watching the last Harry Potter movie, in 3-D, was quite the emotional affair. It was sad to know that the world I surrounded myself with for such a long time, and that gave me comfort when I relocated to beautiful England, had come to an end. Yet, it had to happen eventually and I made my peace with it. Then came The Cursed Child. The excitement began to heighten once more, and now more than a decade later, it reminded me of fond childhood memories, and spurred a Harry Potter movie marathon. Aged 23, a wife and mother now, the books of J.K.Rowling still had the same effect on me as they did during my childhood. Though I wasn’t as passionate to que in the mall at 3 am, dressed in a Snitch or Dobby costume (Motherhood makes that a tad difficult anyway), I was happy to purchase the book the next day, and complete reading the script by the next morning. Harry Potter and The Cursed Child is better than I had expected. Though I wish it was an actual book, complete with the intricate details and descriptions that I have always loved,the story line is indeed perfect. Many presumed that The Cursed Child would be very much central around the three main characters: Harry, Ron and Hermione, yet I actually really enjoyed reading about the relationships and trials that the children went through. Because let’s face it, once you have kids, it’s all about them isn’t it? Yet at the same time, the story refers back to many of the pivotal points in the life of young Harry Potter, and therefore, even though the story is mainly based around Albus and Scorpius, we as readers, still get to relive all the old memories of the Harry Potter that we know. Speaking of Scorpius, Draco’s son, he is possibly my new favourite character. I love the juxtaposition of his personality to his father’s and also how due to the actions of Scorpius, we see a softer side of Draco. I am overjoyed to find there is good left in Draco yet, especially as the books casted him out as one of the bad guys. As for the main twist in the play regarding Mouldy Vouldy, well it was a little insane and sickening, especially as Bellatrix Lestrange’s horrific smirk kept coming to mind, but it was quite apt and tied in very well. I do not want to give too much away, as I understand that many people are still getting their hands on (or watching) The Cursed Child and it is too early to reveal everything. Oh how I wish I was watching the play being acted out in West End, though I may not get the opportunity to do so for a long long time, being an expat living in Dubai. Though it was being acted out in my head, I can only imagine (thanks to the stage directions) so much, and I am convinced that the London play is ten times better with its theatrics. I would expect no less, and the reviews for the show is already outstanding. I will end this post with my favourite word from the script, that crops up a couple of times: Discombobulated, meaning disconcerted or confused. Such fun words is why I love J.K.Rowling’s work and why I became fascinated with literature – reading and writing. I will surely be using this in my every day speech from now! Have you read the Cursed Child or any of the Harry Potter books/movies? When did you first get introduced to the magical world? Feel free to share your thoughts in the comments section below!